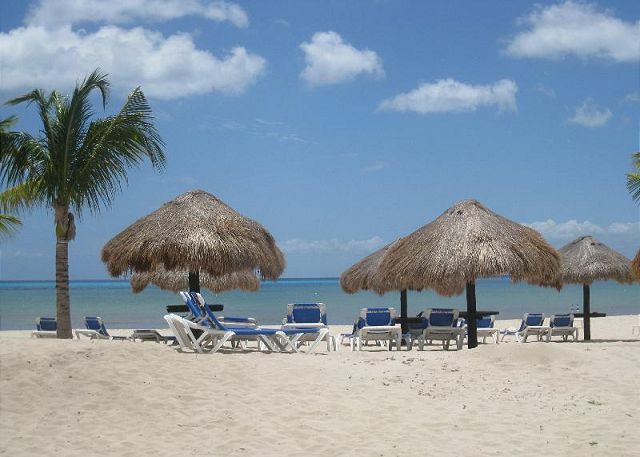 The Residencias Reef Condominiums on Cozumel are located right on San Francisco Beach, the most beautiful beach on Cozumel. Just a 5 minute boat ride to some of the greatest reefs, it's perfect for beachcombers. There's also good snorkeling just off the beach. And that beach stretches on for miles and miles so you can run or jog for as long and as far as you like. 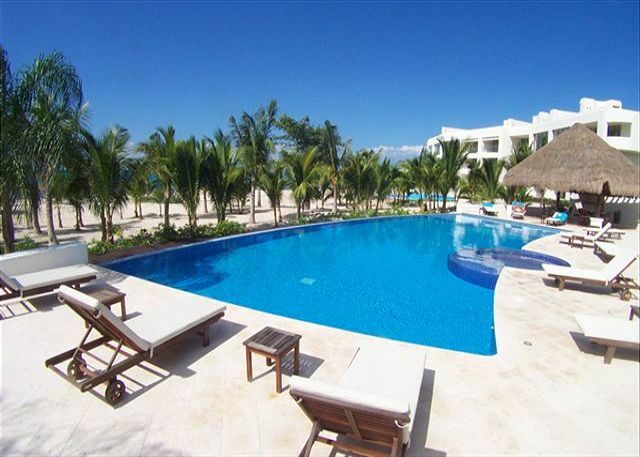 All the Residencias Reef condosare fully air conditioned, have maid service, and access to two large heated freshwater infinity edge pools. The 2nd swimming pool is directly in front of building three which is the building this unit is located in. This unit has a private patio. 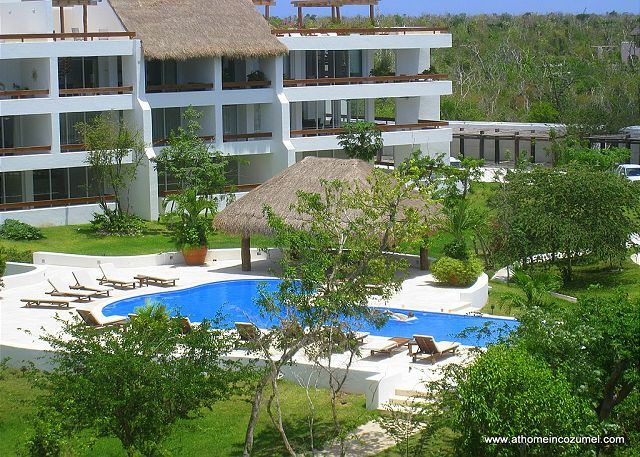 Easy access to the beach and either of the 2 swimming pools. No deadline pressures here in this beautiful Residencias Reef condo. No phone service, but there is high speed Internet service, so if you are traveling with a laptop you can stay in touch with family or business by email or even Skype... if you happen to have that on your computer. Nothing unexpected here except a great big beautiful sunset. The condo is very spacious and nice. It fits all 10 very comfortably. However, there was an issue with the refrigerator not cooling properly. We had to keep our food in the freezer ( which was not freezing either but kept food cool so it didnt spoil). We did contact the manager but the issue was not corrected during the 7 days we were there. We would stay there again if the refrigerator is working properly because it is a beautiful place. This is our third visit to Residencias Reef. We love the diving and the location of the condo is perfect. We have gone with just adults and also with small children. The private chef is wonderful and everything is spotless. We will be back again and highly recommend At Home In Cozumel. Annette is a pleasure to work with! Had a total of 8 family members traveling with us and we all had a great time at Residencias Reef. This unit had more than enough room and was in good enough shape. Could use some new pans and appliances were a little worn, but everything worked fine. Eight of my family stayed for a week in July. 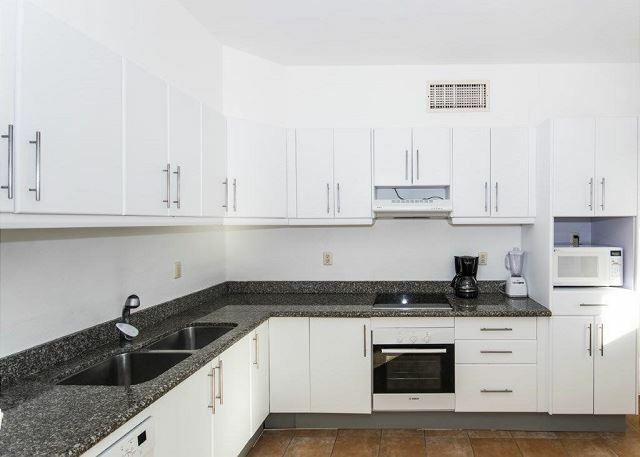 Very large condo, exactly as described and shown in pictures. 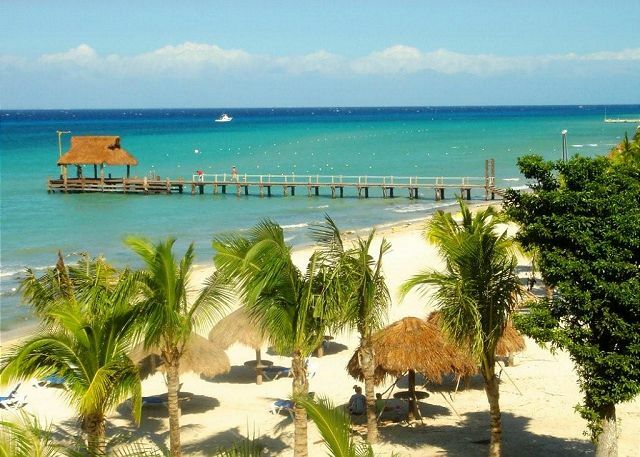 Cozumel is inundated on a daily basis with thousands of cruise ship passengers. This home was a nice escape from the crowded beach clubs, but close enough if you want to join in the activities that those clubs offer. Very clean and well maintained unit. 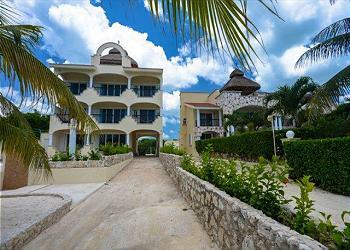 I would definitely recommend At Home in Cozumel to friends and family. 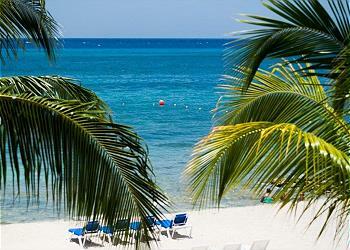 Great place to relax, snorkel and scuba. I highly recommend getting the cooking service - the quality of the food was outstanding. Enjoyed mornings and evenings on the balcony. It was a great place to stay. We had the meal plan which was excellent. My only dig was the floor was not clean. There was dried blood on the floor from the previous occupant which was never cleaned. The condo was very impressive. It was large and well appointed. There were five adults and three children in our group and we had a wonderful time. All staff were very friendly and the cleaners were meticulous. The beach, which is rocky, was just a few minutes from our door and we also made use of the two pools. The only problem we found was two of the outside fans did not work. Also, there are no restaurants/bars along the beach that are open to the public in the evening. Reserving this condo was easy and had no problems at all. Arrival instructions were clearly stated and had no issues even though our party arrived in 3 different vehicles and all fairly late at night. The condo itself is decorated attractively and comfortably. We had room for 7 adults and 3 children. A pack n play was provided for a fee. The young men that checked on us the first morning were very accommodating, helpful and kind. Although we didn't really cook, the kitchen appeared to be stocked well for a large group. The pools and beach are great! Bring water shoes for entry directly in front of complex. Also bring your snorkel gear! Paradise beach is the 2nd or 3rd beach club down the beach and is a lot of fun for families! We rented cars and I would strongly recommend doing so. Lastly, the daily maid service was great! She was so sweet and thorough. In total, six adults and four children stayed in this four bedroom unit for two weeks in March 2016. To our pleasant surprise, the overall size of the common areas within the unit was much larger than expected, each of the bedrooms had lots of spare space, and the expansive walk-around balcony was amazing. It was really a fantastic unit that met all of our needs. Although we never cooked any sophisticated meals, we regularly fed everyone breakfast and lunch without any difficulties. Dinners were normally spent dining out at the Plaza (make sure you go there right away), a quick drive away in San Miguel with our rental cars. For those vacationers who like to eat out or buy groceries regularly (like us), renting a car was a very practical option given the location of the condos – almost halfway between the town and the southern tip of the island. It was close enough to town to make the drives fairly short but not too close to feel the impact of the surge and wane of passengers coming and going from the cruise ships – we really had no sense of the chaotic outside world until we left the property and drove to town. Everyone in our group enjoyed regular visits to the two pools and were pleasantly surprised by extent of local fauna – we saw two tortoises (very cute), one tarantula (even cuter), grey herons stalking and eating the crabs, and not to forget the countless geckos, iguanas, anoles everywhere - our kids were perpetually excited to find and watch the creatures. All in all, we had a wonderful visit and would return in a heartbeat. Was very pleasantly surprised that the unit is exactly as pictured. Was perfect for a two family vacation. It was clean, incredibly spacious and a perfect location away from town. We had daily maid service and anytime we needed to contact the manager whether for light bulbs or a key he responded. Beach was great and lounge chairs plentiful. There were beach towels ( previous reviews said there wasn't), as well as pads on the beds to make them very comfortable. There were plenty of kitchen utensils as well. Grounds were clean and well cared for as well. We would go back again and recommend to others. Short drive into town for groceries and dinners. 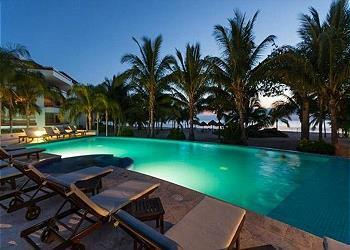 Residencias Reef has a perfect location. 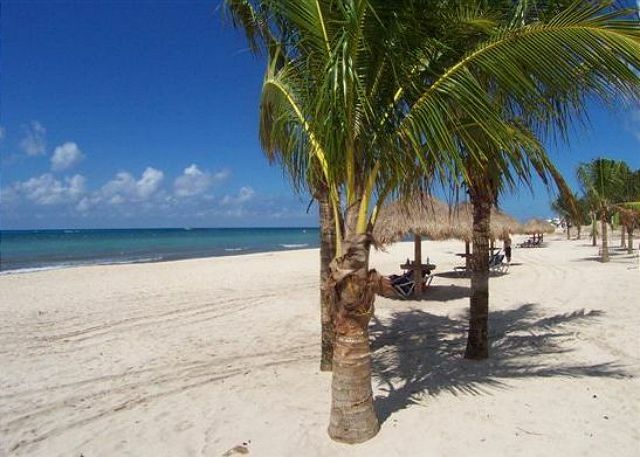 Great beach and close to reefs. The best thing was the in room chef. Alex was great. Food was better then any of the restaurants we've eaten at including Kondesa, casa mission, and buccanos! Unit was large and clean. Did not have washing machine but access to washer and dryer in maids closet down the hall was great. 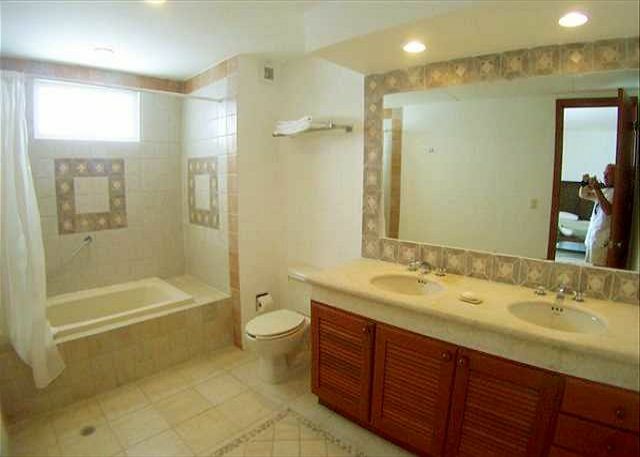 The only thing missing was enough towel racks/hooks. It would have been nice to have more places to hang wetsuits and towels. kitchen could use updating. there was water damage to some of the cabinets. 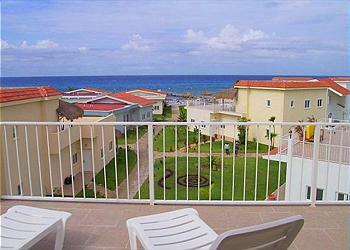 Unit has no ocean view but its 100yards to a great ucrowded beach. Muy limpio y en buen estado. The condo was great with lots of room for everyone. It would have been nice to have some wine glasses and maybe some mosquito spray. The maid service really good as well. We were pleasantly surprised how clean and how large this condo was. A little disappointed that there was no clothes dryer. It's a good drive from the ferry so we rented a car. the beach was not.g [d.for.snorkeling but good enough to swim in. There are venders close buy willing to sell you a tour for anything. We were happy with this condo. Great location, nice condo, nice pools. This condo could not have been more perfect for the wedding weekend we attended. Easy access to downtown if we wanted it, but it was perfect to just get away. Chef Alex was incredible. I highly recommend the in home chef option. The food was amazing, and freshly made each meal. We loved every minute and can't wait to return again. Nice location but a little farther to the dock to haul scuba gear compared to Costa del Sol. 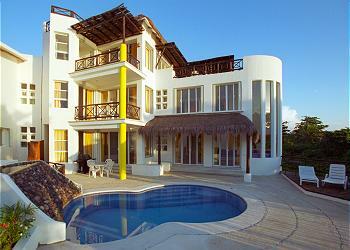 Renting a condo at Residencias Reef was like having a private vacation villa in Cozumel. The condo itself was gorgeous with a wrap around balcony and beautiful interior. 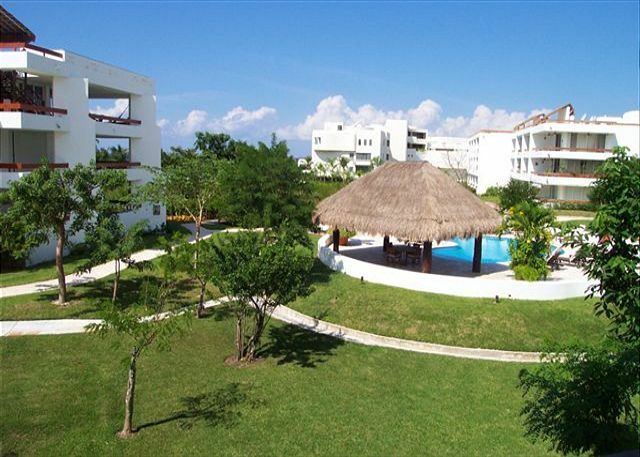 The grounds are beautifully-maintained and it's right on the beach with 2 great pools. We loved how quiet and peaceful it was. We have been back to this condo complex five times now and it continues to be the best spot on the island. I love it's location and enjoy the drive into town. The beach is excellent and never crowded. The site is spacious and clean. The pools are warm and clear. Staff is always trustworthy and professional. Excellent place, but no TVs in the rooms. Beds too hard. Nice location. Had to rent a car for transportation to town or taxi. The place is too far out of town and the nearest store is 9 miles away.. The staff was very friendly and helpful. If you want t be away from it all, this place is it. Would I come back? Yes, but would ask for a unit closer to the beach. Excelente servicio y mantenimiento del departamento. Wonderful location and fantastic property. 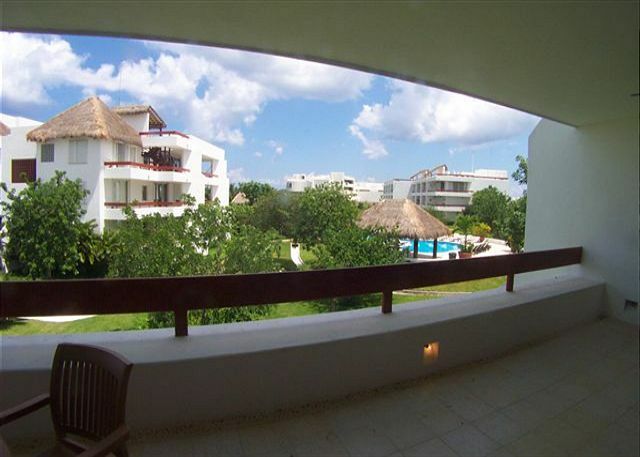 Residencias Reef is a great complex. Have stayed at complex several times, but first time in this condo. Would stay in the same condo again because the price is right. However, all the beds are really hard. Not enough pillows, towels, or kitchen necessities. Would have been nice to have a washer and dryer like the other units. Unit manager was never seen either. Our experience at Reef 7200 was wonderful. Highly recommend having a cook. What a treat and excellent food! All of the staff were very professional and friendly.We will return. relaxing at "AT HOME IN COZUMEL"
WE STAYED FOUR RELAXING DAYS AT PROPERTY 7200 WICH WAS PERFECT FOR US, JUST AFEW STEPS FROM THE BEACH AND TWO LARGE POOLS OUR VACATION WAS UNFORGETABLE AND WECAN NOT WAIT TILL NEXT YEAR TO GO BACK!!! JUST PLEASE FIX THE COFEE MAKER!! All-around fabulous. Would recommend to anyone. 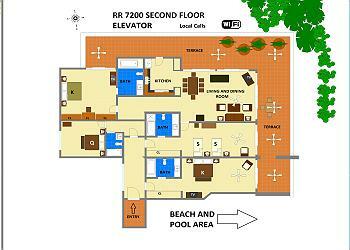 We enjoyed the location of the property and the pool. The cleaning lady was very thorough and helpful. However, there were not enough dishes or glasses for all of us nor tea towels or a dish cloth. Pool towels would also be helpful. We appreciated the drinking water but salt and pepper would be nice and perhaps a few simple spices. A kettle would also be a good addition to the kitchen. The property manager came the first night to bring bedding but we did not hear from him again and the promised glasses never came. There were no instruction on check out. Although the manager was most helpful in giving us access to the housekeeper's facilities, a condo of this size and price MUST have its own. Modern Condo footsteps from the beach - Sweet! 1) Laundry equipment was not present in suite and instead we were advised we could use laundry machine down the hall only during times when housekeeping was not using it. 2) No satellite TV - just 5 channels of mostly non-english channels. Neither of these problems were huge issues - but lack of these meant it was not exactly as listed on the website.